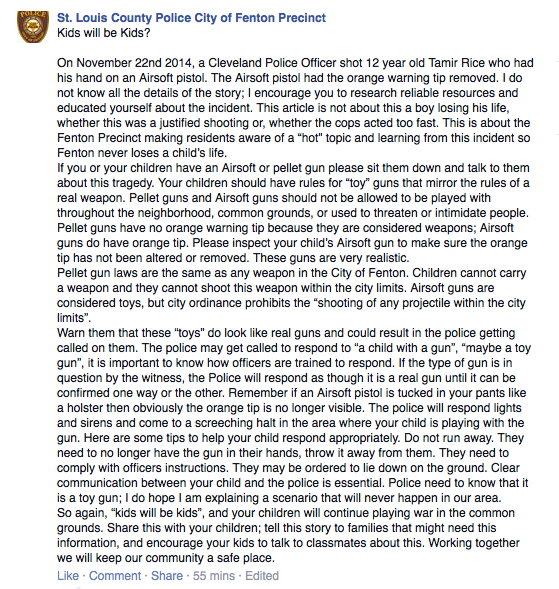 St. Louis County Police's strange response to Tamir Rice death: "Kids will be kids"? On Thursday morning, the St. Louis County Police Department's official Twitter account tweeted the link to an article posted on a precinct's Facebook page responding to the police shooting death of 12-year-old Tamir Rice in Cleveland. The post, which was quickly removed, explained that Rice's death was the result of confusion (cops thought the Airsoft toy gun he was holding was real), and attempted to set forth proper procedure regarding children and toy guns in order to prevent a similar accident. "This article is not about this a [sic] boy losing his life, whether this was a justified shooting or, [sic] whether the cops acted too fast," the post above reads. "This is about the Fenton Precinct making residents aware of a 'hot' topic and learning from this incident so Fenton never loses a child's life." While the intention behind posting the note was likely honorable, its tone strikes an uncomfortable note that both puts a certain degree of blame on Rice and his parents, while referring to the death of a boy as a "'hot' topic." The post is even more ill-advised given the national attention the department has received after protests in Ferguson led to nasty confrontations between St. Louis police and civilians. Additionally, reports recently surfaced indicating that the Cleveland police officer who killed Rice previously had been found emotionally unstable and unfit for duty. According to reporter Jon Swaine of the Guardian, a department spokesperson said of the post, "I haven't even read it." Mediaite's Evan McMurry spoke with Dilks, who explained his questionable turn of phrase: "I too was a kid, and I too would have done the same thing as Tamir Rice did," Dilks explained. "I was allowed to go play with guns and have BB guns -- we didn't have Airsofts at the time. The point of the 'kids will be kids' is that's what kids will do ... The point of putting [the post] out was to educate and make sure something like this doesn't happen in the city of Fenton or in our area." "It's a tragedy," Dilks continued, referring to Rice's death. "It's a shame that a child got shot. I guess that's all I should probably say about it."